This doesn't even sound that much like news as Morrissey has cancelled shows from just about every North American tour in the last ten years but the singer has pulled out of more appearances. Earlier this week, he cancelled shows in Boston and Philadelphia due to "illness in the touring party", along with an appearance on Stephen Colbert and, now, tonight's KROQ Almost Christmas Acoustic Show in Los Angeles. It is with great regret that we must inform you that Morrissey's performance for Sunday night's show has been cancelled due to illness. 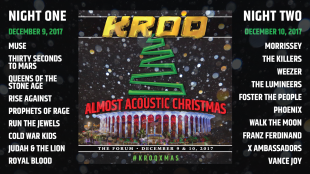 Earlier this week the tour's performances in Philadelphia and Boston were also forced to be canceled, but it was hoped that conditions would improve for the KROQ Almost Acoustic Christmas performance to continue as scheduled. Morrissey's team and KROQ apologize greatly for this disappointment and Morrissey looks forward to making it up to the Los Angeles fans as soon as possible. That ends his U.S. tour on a down note. According to Altpress, that brings the total number of shows cancelled by Morrissey to 127 in the last five years. His next show is February 16 at the AECC BHGE Arena in Aberdeen, UK.